Moth Speaker: Just doin' some watering...! Hellooo Thursday. :) And a good Thursday at that! It's my last day of the week because of a staff development day and MLK day, so we have a four day weekend! I'm pretty excited. All weekends should be four days long, I think...! Are any of you doing anything special for this long weekend? Most schools/works give MLK off, right? Tell me about your plans! I wore this yesterday and quite enjoyed it, so I made sure to take some photos. This is the side deck of my house, if you were curious. Lately I've been loving blouses and collared shirts a lot. I find myself thrifting more and more of them! Many are vintage too, which I love. This chambray button up is from J. Crew, though. Many of you readers have probably seen me wear it before - it's one of my favorites! I love the denim with floral! You look super cute. How precious! 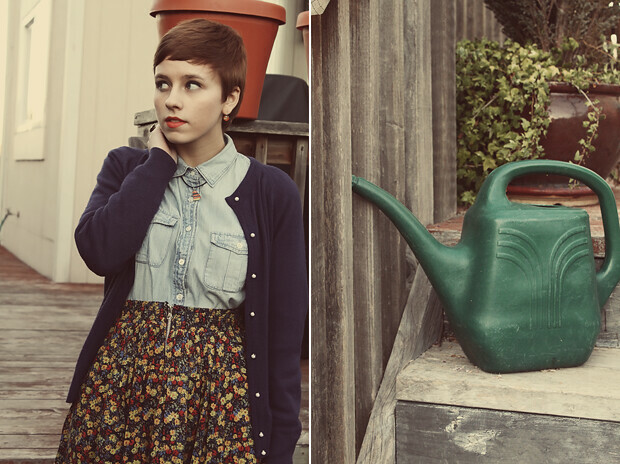 And I love the idea of the watering can to pose with :) Too cute. LOVE the high waisted skirt! Love your lip color in these pics & that skirt! i have yet to find a perfect thrifted denim blouse! the one you are wearing so beautifully, is perfect. i say this all the darn time.. but i love your hair. seriously. Adorable! 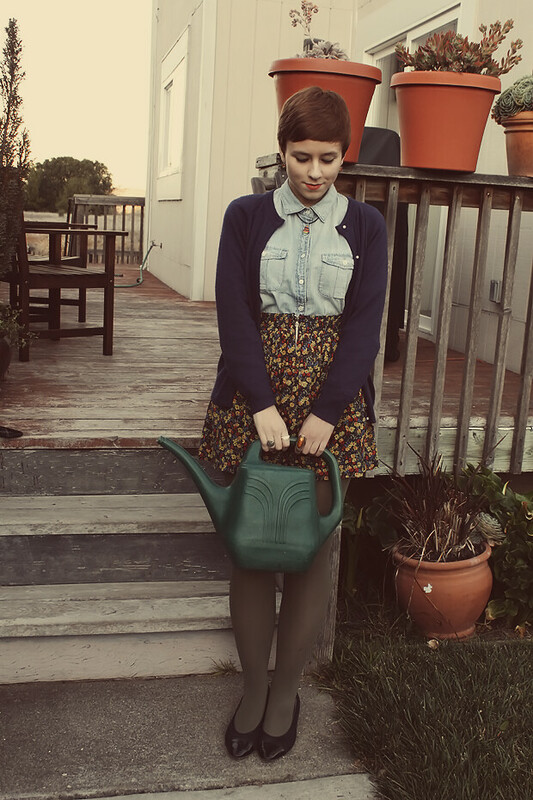 I love the pose with the watering can. 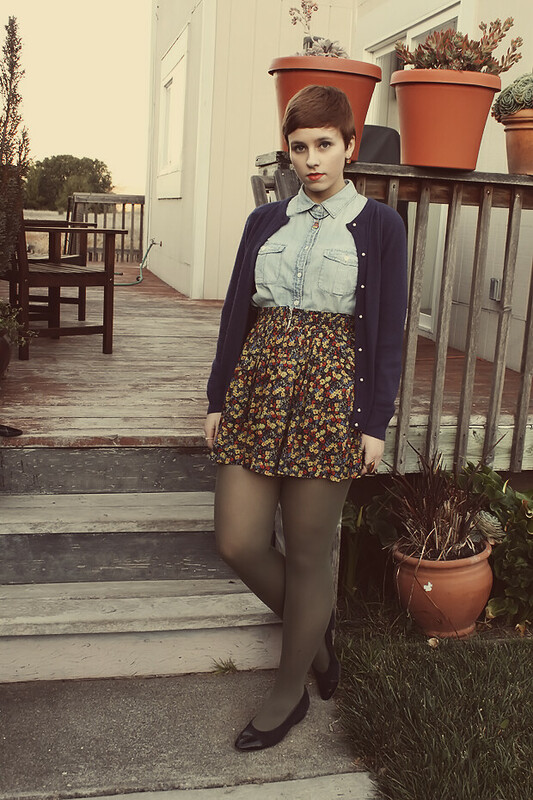 Love the denim top and color of your tights! Adorableness a millions times over here Elanor...accessorizing with the watering can...I love it! 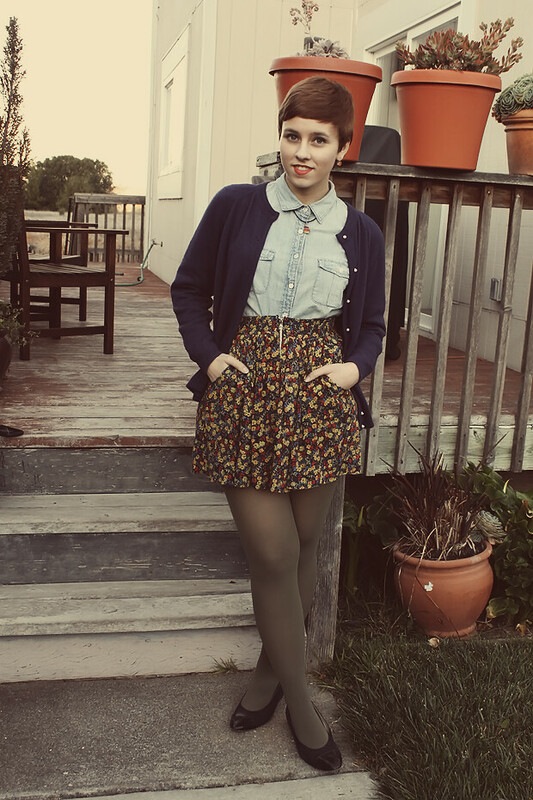 These are simply beautiful photos and a simply beautiful outfit:) I really adore your makeup too.